All-new for 2017, this is the best premium-compact car for you if you’re looking for a solid balance of performance, luxury, technology, and safety features. Again offered with front- or all-wheel drive, this fifth-generation A4 debuts with a turbocharged four-cylinder engine. The high-performance S4 with a turbo V-6 will return midyear. Slightly larger but also lighter than the 2009-2016 generation, the redesign A4 is based on parent-company Volkswagen’s new “MLB” platform. This modular chassis also underpins Audi’s redesigned 2017 Q7 midsize-crossover SUV. Expect derivatives of this architecture to appear in future VW/Audi cars and crossovers, including the upcoming 2018 Q5 premium-compact SUV. Should you buy a 2017 model or wait for the ’18? Aside from perhaps some new paint colors and maybe a bit of equipment shuffling, there’s no reason to wait for the 2018 A4 – unless you’re a diesel fan. Audi’s planning the return of a diesel version, once VW sorts out the emissions-tampering controversy that suspended sales of VW, Audi, and Porsche diesel models. 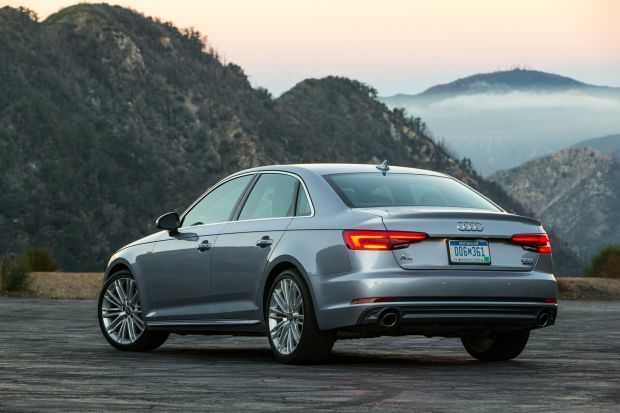 The diesel A4 could conceivably be ready for model-year 2018. Meantime, the ’17 redesign sets the pattern for this car until its next freshening, likely for model-year 2020 or ‘21. At launch, the three-tier lineup consists of the base 2.0T Premium, volume 2.0T Premium Plus, and top-line 2.0T Prestige models. All have a turbocharged four-cylinder and a dual-clutch automatic transmission. Front-wheel drive is standard, Audi’s quattro all-wheel drive (AWD) is optional. The S4 will come with quattro and should be available in Premium Plus and Prestige trims. It’s new from the ground up but the ‘17 A4 doesn’t look a whole lot different than its predecessor. This is not a bad thing. Audi is respected for giving its volume-selling vehicles simple lines that stand the test of time. Here, a slightly more aggressive front end with sharper angles on the grille and headlights contributes to a very clean overall look that should appeal to entry-luxury shoppers. Thankfully, Audi brings the A4 up to date with available safety and convenience features rivals have offered for years for years. At the same time, the company is making available some brand-defining high-tech amenities, which we talk about below. Interior materials quality is very good overall, but we observed a few instances of apparent cost-cutting, with some textured plastics not conveying the high-end look and feel we’ve come to expect from the brand. Passenger and cargo room are class-competitive, nothing more. The S4 will again be distinguished by unique exterior trim, including aluminum-finish mirrors, and by front buckets with added bolstering and leather-and-microfiber upholstery, plus specific instrumentation. The 2.0T line again uses a 2.0-liter turbocharged four-cylinder, upgraded to 252 horsepower and 273 pound-feet of torque, increases of 32 and 15, respectively. It pairs with a 7-speed dual-clutch automatic transmission. All models come with Audi drive select that enables the driver to customize gear-shift points, steering assistance, and suspension firmness within comfort, auto, dynamic and individual modes. Audi claims 0-60-mph in 6.1 seconds with front drive and 5.7 with quattro. The 2.0T AWD examples we tested didn’t feel quite that fast, but we were never left wanting more power. The transmission fires off lightning-fast shifts and responds quickly to throttle inputs. Quattro delivers exceptional handling on dry roads and an extra measure of security on wet or snowy ones; it’s an option we recommend. The previous S4 used a supercharged 3.0-liter V-6 with 333 horses and 325 pound-feet of torque. Aiming for better fuel economy and more power at lower rpm, the ‘17 S4 will have an all-new 3.0-liter V-6, this one turbocharged to produce 354 horsepower and 369 pound-feet of torque. It’ll mate with an 8-speed automatic transmission. Audi predicts 0-60 mph in 4.7 seconds and a top speed of 155 mph. Enthusiasts will be disappointed that no manual transmission is available, but Audi has been phasing them out of its entire product line for the last few years. Not even its R8 supercar comes with a manual any more. Standard equipment on the A4 Premium includes leather upholstery, 12-way power driver seat, three-zone automatic climate control, rearview camera, Audi’s MMI infotainment interface with 7-inch dashboard screen, and xenon headlights with LED daytime running lights. Premium Plus models add full LED headlights, heated front seats, Bang & Olufsen audio system with 19 speakers, keyless entry with pushbutton engine start, Audi SOS telematics, and rain-sensing windshield wipers. Prestige versions get a navigation system with 8.3-inch dashboard screen, MMI interface with handwriting recognition, head-up display, blind-spot alert, and Audi’s virtual cockpit, which replaces a traditional gauge cluster with a 12.3-inch LCD display that can be configured to show driving data in a variety of ways. In our testing, Audi’s updated MMI system is vastly improved. It’s more functional, easier to use, and faster to respond to use input. The handwriting recognition is surprisingly accurate, and we appreciate that Audi has added dedicated buttons for radio presets. From a technological standpoint, the virtual cockpit is interesting if nothing else. You can have it display information like a traditional gauge cluster, or shrink the speedometer and tachometer to provide a larger view of secondary information, including a redundant map readout. As a practical piece, though, it strikes us as more of a gimmick, and we fear to think what would happen in the event of a system failure. 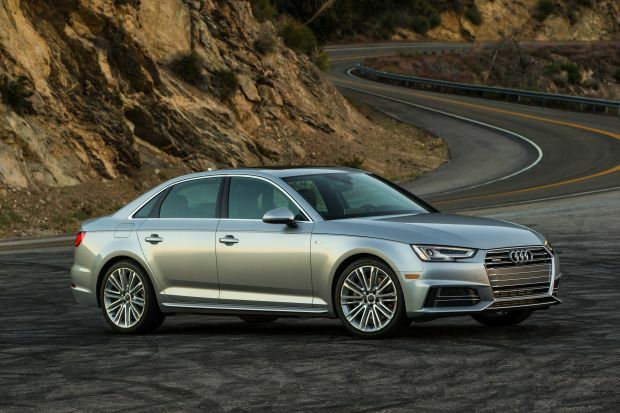 Audi is positioning the A4 squarely in the realm of other four-cylinder premium-compact cars, most notably the class’ sales leader, the BMW 3 Series. The front-drive Premium starts at $38,250, inclusive of Audi’s $950 destination fee. Across the board, add $2,100 for AWD, $350 for torso-protecting rear-side airbags, $350 for genuine wood interior trim that replaces the standard aluminum inserts, and $575 for any paint color other than white or black. Audi also offers a number of custom paint colors for $3,900. On Premium models, the $900 Convenience Package adds a memory driver seat, satellite radio, and keyless entry/ignition. The $750 Sport Package nets sport bucket seats and a firmer performance suspension. Getting the Sport Package makes you eligible to add 18-inch wheels in place of 17s for an additional $800. A navigation system, HD Radio, Bluetooth streaming audio support, and Audi connect telematics are bundled in a $2,400 MMI Navigation Plus Package. Heated front seats are $500. The Premium Plus starts at $42,050. It can be ordered with the Sport Package, and when you do so, you can add another $800 to replace its standard 18-inch wheels with 19s on summer-only performance tires. The $500 Cold Weather Package adds heated rear seats and a heated steering wheel with gearshift paddles. The $3,250 Technology Package includes navigation, blind-spot alert, Audi connect, HD Radio, and the virtual cockpit. Prestige versions start at $46,850 and offer the same wheel/tire, Sport, and Cold Weather packages as the Premium Plus. It also has several exclusive options. The $1,450 Warm Weather Package nets ventilated front seats and rear side-window sun shades. The $1,800 Driver Assistance Package adds adaptive cruise control, active high-beam assist, lane-departure warning, and traffic sign recognition. An adaptive suspension is another $1,000. At about $50,000, the AWD Premium Plus with Technology Package is probably the best value here, but don’t ignore the Prestige. Even loaded with AWD, Driver Assistance, and Warm Weather packages, it can still undercut its comparably equipped German-brand rivals. The S4’s suspension and quattro calibrations will be tuned for high performance and it’ll have quad-tip exhaust pipes and a base price around $50,000. Discounting rivals that are diesels or hybrids, this is among the most fuel-efficient cars in the segment. EPA-estimated fuel-economy ratings are 25/33/28 mpg city/highway combined for front-drive A4s and 24/31/27 with AWD. Audi requires premium-grade 91-octane gasoline. What’s next for the A4? With the S4 coming and a diesel pending, don’t expect major changes until a midcycle freshening. If Audi sticks to the previous A4’s update schedule, that freshening would be for model-year 2021, but automakers are accelerating the pace of change, so it could come for ’20. It would involve a cosmetic facelift, some interior and feature updates, and could serve to introduce a gas-electric hybrid or plug-in hybrid model. Can the 2020 Honda Pilot fend off younger rivals, like the redesigned Explorer and Highlander, and the all-new Palisade and Telluride? Jaguar’s E-Pace crossover needs a Jaguar-worthy interior. Will it get it for 2020? More than a pretty face: where will the 2020 Mazda 6 fit in the midsize-sedan game? Throwback values vs. fashion-forward pressure: can the 2020 Toyota Avalon manage its dual burden? © Copyright Car Preview 2016, All Rights Reserved.